We are planning 2 interesting litters. Litter "À" (Ch.Erinade Extinguished x Ch.Pendledell Anise) DOB 10.10.2003 . 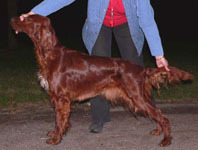 Litter "B" (Ch.Scirocco's Phil the Red Destiny x Ch.Irish Melody Redheaded Girl) DOB 06.01.2005.